For 673 accepted trainers, the journey to the Retired Racehorse Project‘s 2019 Thoroughbred Makeover has begun! Over the next nine months, three of those trainers will blog their journeys, including their triumphs and their heartbreaks, successes and failures, for Horse Nation readers. 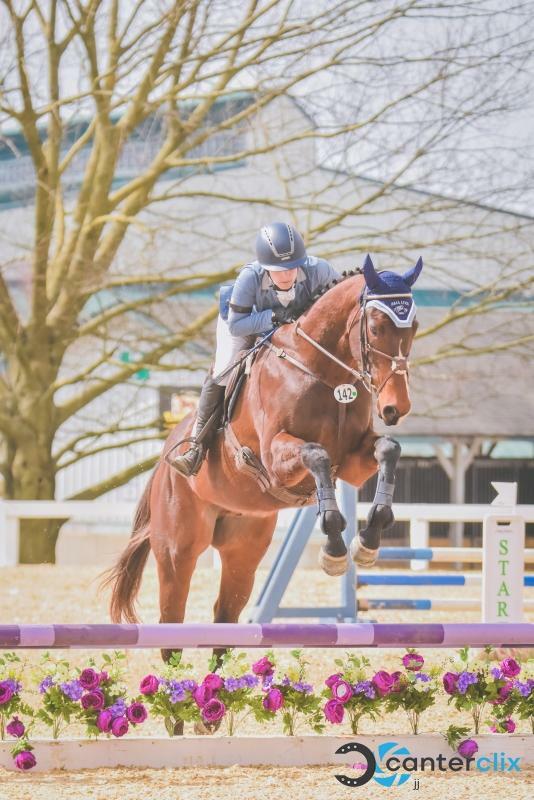 Kristen Brennan is back today, sharing exactly what her Makeover hopeful Geoffrey means for her as a rider. Being thrown into the last element of a triple one jump from the finish timers in the Rolex Arena at the Kentucky Horse Park ranks pretty high on my list of moments I wish a) never happened and b) if it did happen, no one was there to see. But alas, it did, and I picked myself up, retrieved Marcus from the in-gate steward and made some self-depreciating joke to everyone watching as I walked out of the ring. I laughed and tried to act like I brushed it off, but the truth is that fall was the icing on the cake of several seasons’ worth of trouble in stadium, and I fell apart as soon as I was away from everyone. 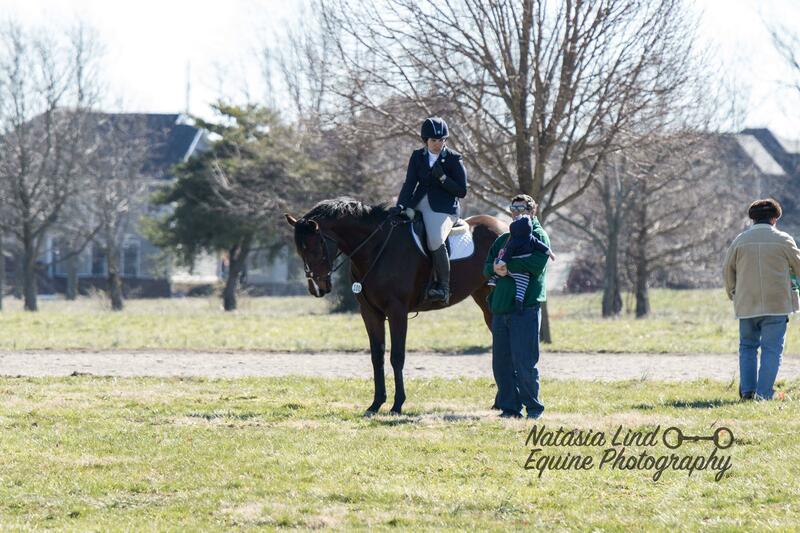 We’ve all had those moments — and usually as eventers, we wipe the dirt off, climb back in the saddle and kick on. But this time, for me, was different. I was embarrassed. I was tired of working so hard and having it all fall apart in the ring. I was worried people thought it was me, or worse, thought he was in pain and that I didn’t care. I was mentally and emotionally exhausted from riding a “feast or famine” horse. I was filled with guilt that I spent hours away from my infant son only to put myself in situations where I could be hurt. Worst of all, I was scared. Though I consider myself a half-way decent rider, I have never had a ton of confidence in myself nor have I ever been very brave. I’ve melted down in the stadium warm up and the start box more times than I care to admit, but I can usually channel that fear into kicking on, and it turns out I ride pretty well through tear-stained eyes. As I got more miles over bigger jumps and at faster paces, I never got bold per se — I just got more confident that I could stick it if Marcus pulled his characteristic spook and stop. But last season my stickability was limited by sleep deprivation and weakness, and as I hit the ground for the fourth time in five months, so did my confidence. Not really sure how to move forward, some advised me to find a schoolmaster to ride, and while I would have loved that, it just wasn’t in the budget. Others told me to take a break, but I knew for my own sanity, I had to continue to ride. Despite being highly educated and holding two advanced degrees, I can make some pretty dumb decisions. To some, taking on a three-year old OTTB after last season’s track record might make the top five list of “KB’s worst decisions that seemed like a good idea at the time.” I knew this, so for months I hid the fact that I even got Geoffrey from many except for close friends. I was worried that people would tell me it was a mistake (because let’s face it, it probably was) or judge me for taking a break from Marcus (something I still wrestle with the heartache of). 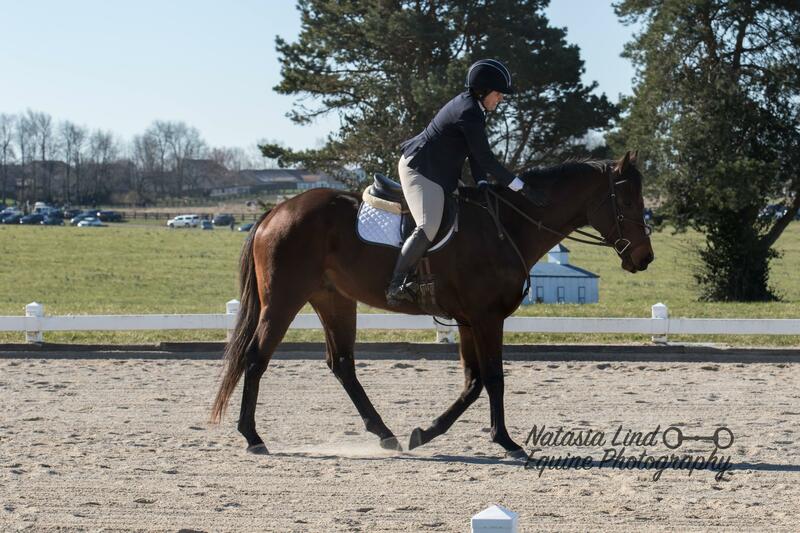 So for the past few months, I’ve found myself starting our journey to the 2019 Thoroughbred Makeover doing a lot of damage control. I’ve spent my rides slowly building my confidence back up and hoping my dumb decision turns out to be a great decision. And you know what? So far it’s working. I find myself looking forward to riding again. I can once again canter down to a jump without the panic of wondering if I am going to end up on the ground. I don’t seek out my “lucky” socks before a ride hoping they’ll keep me from hitting the dirt. As a result, my confidence, though nowhere near restored, has started to come back bit by bit. Geoffrey and I even tackled our first horse show together a few weeks ago. It was just a quiet local dressage show, but I was nervous and contemplated scratching before I even loaded my trailer. But I didn’t, and Geoffrey showed me what a perfect gentleman he could be. I didn’t lunge him to get the sass out and I never felt the need to grab the neck strap I had pleaded with the judge to let me use. 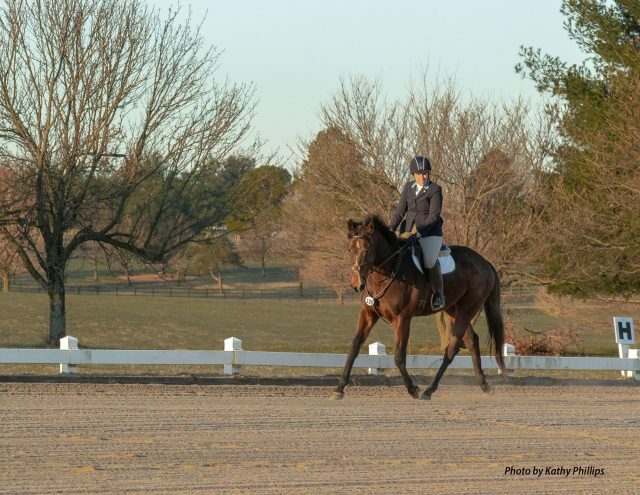 He took everything in stride, stood patiently while I tried to remember my tests, and let me relax and focus on FUN when I trotted up center line. We even earned a couple decent scores and some pretty ribbons! There is a part of me that feels guilty that I put this on him — a young, green horse shouldn’t bear the burden of having to fix his rider’s past. But the other part of me tells me as long as I continue to be kind to him, ride correctly, and be his source of food, he couldn’t care less. I know my limits — I’m not ashamed to ask for help and to admit that sometimes I need someone else to take over the ride. Even though he was perfect for our dressage debut, I handed his reins over to a friend for his first combined test this past weekend. I am a firm believer that these first experiences for young OTTBs must be positive, confidence building and leave them thinking “Woo hoo! The braiding thing is a little silly but horse shows are a BLAST!” The Claiborne Ring at the Kentucky Horse Park has left me with so much stadium baggage that I need a pack mule to carry it all, and I recognized that this could prevent me from giving Geoffrey the ride he needed. Of course standing on the ground being the cheering section was a little hard. I would love to have been the one to pilot him around his first course instead of the person meeting him at the in-gate with tons of peppermints. But watching him jump around like a total professional and have a great experience quickly reminded me that I did right by him and that there will be plenty of more opportunities for me to be in the driver’s seat when we are ready. I can’t wait for those. Until then, we’ll continue working on me as we work on him and we’ll keep taking baby steps in the right direction towards the Thoroughbred Makeover.